Talking about outfits isn’t something I’ve done in a long time, since deciding last year that outfit photos weren’t for me or my blog I’ve avoided writing about clothes in this way and instead focussed on collages of items I want or outfits I’d wear but having recently added a number of great pieces to my wardrobe I’m finding my way back (see my previous blog post for another new in item). I’m rediscovering my style so I want to talk about it again and whilst I won’t be taking traditional outfit photos, as I did before, I’m going to try a few different ways to present outfits; starting with a flat lay. Pink of any shade isn’t something that I reach for very often, it’s just never really been my bag. I think that because we’ve always been conditioned that girls should wear pink from a young age I’ve chosen to rebel against that wherever possible over the years. Even now it’s not easy to buy non-pink items for a baby girl as generally the choice is either a type of pink or white. I remember in my early teens my Nan always commented on me wearing blue far too often because I was avoiding pink but she knew better than to force pink upon me and wasn’t a fan of the colour either and so she encouraged me to wear other colours buy pushing me toward them which I’m very grateful for as I can attribute my love of reds to her style advise. Nowadays I’m still not drawn to pink but neither do I shy away from it. 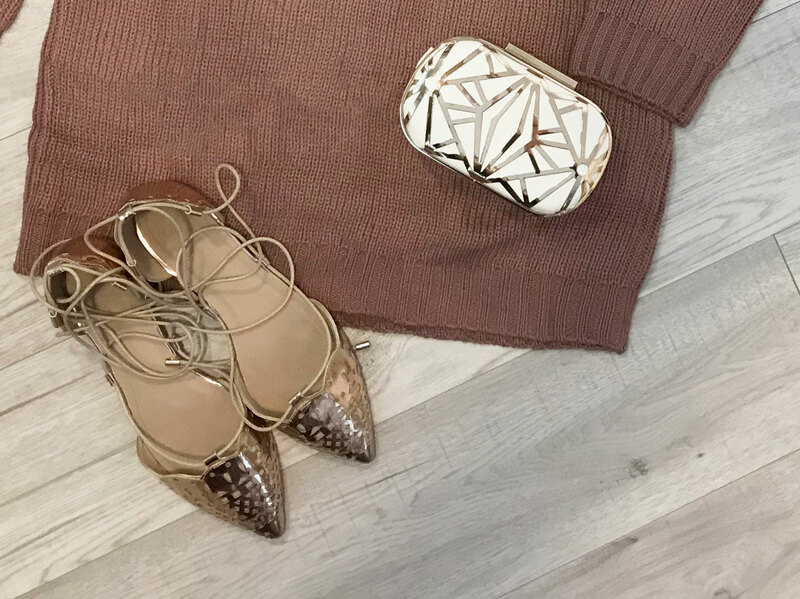 I’ve actually introduced blush pink to my lounge decor alongside rose gold/copper, different toned greys and lots of white so to me it made sense to wear this dusky rose jumper from Tobi with gold tone accessories and a bit of white if possible (repping your living room is a trend that could catch on). The cold shoulder and high neck detail of this jumper dress makes it one of those diverse pieces that can be dressed up in a number of ways for a night out, evening dinner or casual brunch (have you ever noticed that my mind is always on my stomach even when thinking about clothes?! Oh well). On this occasion I chose to wear it sans-bottoms to a friends birthday meal, accessorising with rose gold and champagne gold tone accessories to glam the outfit up a little (but not too much). The clutch is one of my favourites because white and gold together is a dream. Add geometric clean lines to this and I’m in love. Complimenting this I opted for my Michael Kors chronograph watch, rose gold pointed flats, gold toned rings (not pictured) and 3 sets of simple gold studs (also not pictured because they’re too teeny tiny). 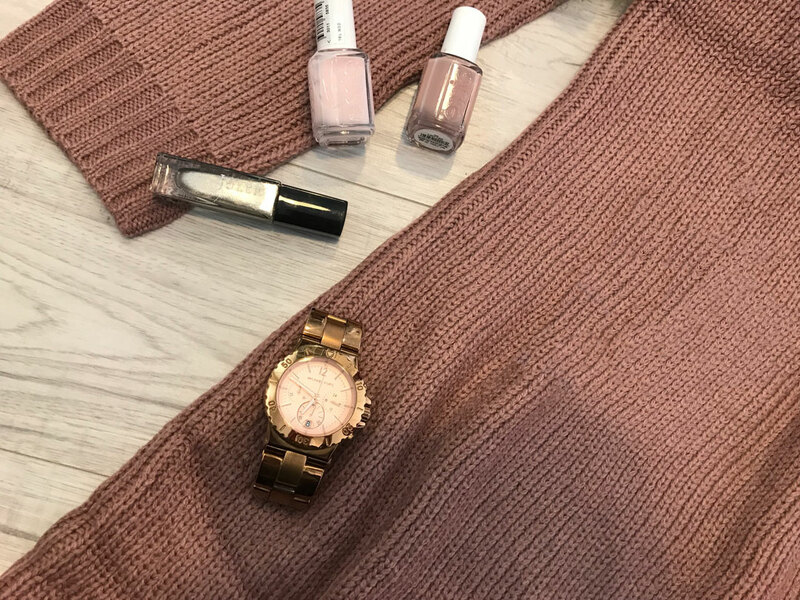 I also like to wear complimentary nail polish where possible so a couple of pink-y shades by essie, that I happened to be wearing already, were finished off with a shimmering champagne index nail that perfectly worked with the jumper and accessories.